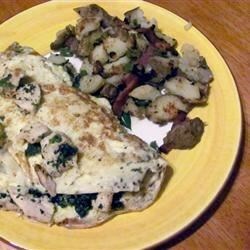 "Tender chunks of leftover chicken provide a nice change of pace from the usual ham in the omelet Sonja Blow makes in Groveland, California. 'Served with toast and tomato slices, it's a special breakfast for two,' she notes." In a bowl, beat eggs, onion, parsley, tarragon, salt and pepper. Melt butter in a skillet over medium heat; add egg mixture. As eggs set, lift edges, letting uncooked portion flow underneath. Sprinkle with chicken and celery seed. When the eggs are set, remove from the heat; fold omelet in half. Great flavor combination! The tarragon was especially nice. I added a diced tomato and a sprinkle of parmesan to the filling. It was a delicious omelet. This was a nice way to use up one lonely leftover chicken breast. I did add a small amount of leftover spinach too. Thanks!